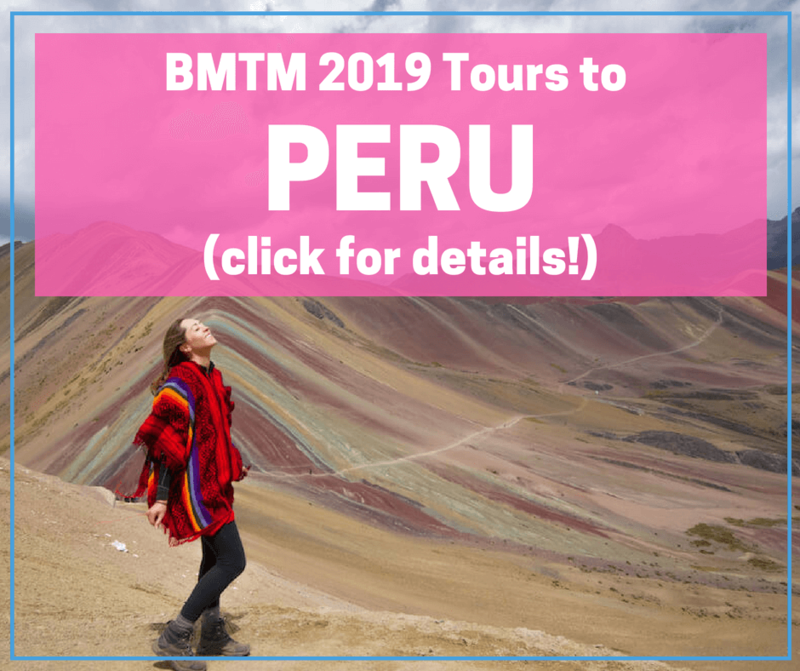 Let’s talk about Rainbow Mountain, Peru. This Insta famous mountain with layered shades of red, yellow, and green recently exploded in popularity and I’m going to have to point the finger at Instagram. The social network is how I found out about it too, and I’m so glad that I did. All over Google, I read various headlines urging me not to go to rainbow Mountain, and others just showing overly saturated images of it. So what’s it really like? 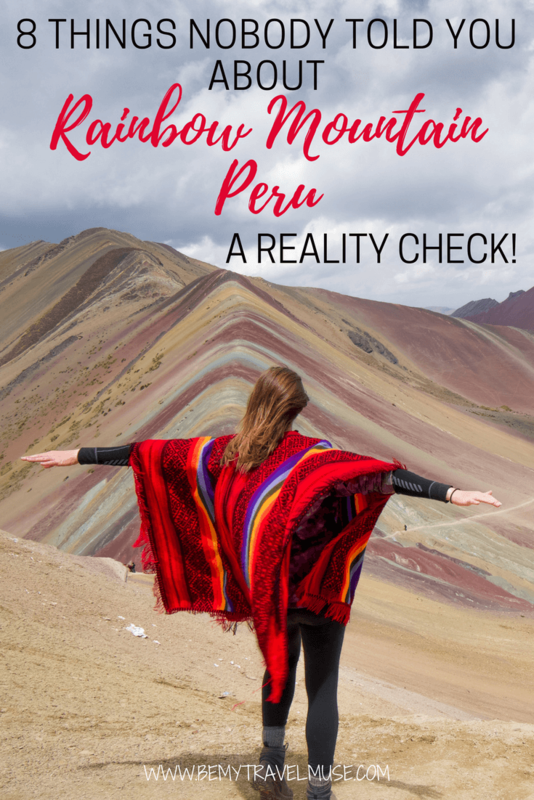 You’ve probably seen pictures of Rainbow Mountain, part of the Ausangate mountain, also known as Vinicunca and Montaña de Siete Colores, with all kinds of color enhancement. Many of the images are, of course, digitally enhanced. That said, I was amazed by the colors in person, clearly seeing the layers of red, green, and yellow. It’s not just the mountain itself either, the entire surroundings are colorful. You can actually see colorful mountains like this all over the Andes, including in Patagonia, however this is one of the most brilliant, exposed, and accessible. Now for the rock nerds like me: The different coloration is due to mineralogy including chlorite for green,ferric sulphide for the yellow, and oxidized limonite for the red (probably). The photo above is not digitally enhanced, and you can expect to see colors like this when you visit yourself. Rainbow Mountain sits at 5200 meters in elevation, which is over 17,000 feet. To put this into perspective, it’s only slightly lower than Everest Base Camp and the Annapurna Circuit‘s Manang Pass in Nepal. As anyone who has hiked at altitude knows, you can hardly breathe in air that thin. Walking and talking at the same time are basically out of the question. Don’t even get me started on munching rainbow skittles while climbing to Rainbow Mountain. I have tried it, it was not successful. The day hike itself is not particularly difficult. For most of it, it’s a gentle upward slope. However the altitude makes it infinitely harder. Please don’t make this the first thing you do upon arriving in Cusco. Give yourself at least a few days to acclimate. It doesn’t have to do with physical ability or how your body reacted to altitude previously. Each experience in altitude is a new one and it can be dangerous if not respected. The hike in can vary from 9 days to one day. The vast majority of visitors visit for just one day, since the multi-day track is challenging and very high up. However the multi-day Rainbow Mountain hike takes you past snowcapped mountains, glaciers, and is on a quiet circuit with almost no other hikers. This is one I would love to do, so in case you would too, I’m just going to leave it here. To do the day hike from Cusco, you can book with a local tour operator that will pick you up between 3 and 4 AM in town. The drive to the start of the trail takes about three hours and begins around 4000 m. Entrance to the Rainbow Mountain costs 10 soles or it may be included in your transport fee. Unless it’s super high season and you’re concerned about availability, I’d wait to book a horse until you arrive rather than paying ahead of time online for 10x more. Read below for how to do it for cheaper. Not a horse (that’s me!) but look at that lovely view! Upon starting the hike you will see plenty of local Quechua people with their horses. They are also selling coffee for 2 soles each and even allowed me to mix Milo and coffee – I was so excited I just had to share. The going rate, at least at the time of this writing, is 60 soles for a horse all the way from the beginning to the base of the mountain. At that point you will have to dismount and climb the rest yourself. When I went in April there were enough horses, though I imagine in the busier months of June and July you’ll need to make a decision right when you arrive about whether you want a horse or not. However when I was hiking, people were constantly offering the horses all along the way. They know that people want to attempt it on their own in the beginning and eventually relent and give up. Though it was a seductive offer, and they taunted me often with it, I declined and hiked the whole way up to the top by foot. However I had just finished the Inca Trail and I was already fully acclimatized. It was still very difficult for me and I took it slow. If you want a horse don’t be shy about it, just get one and enjoy your day. What I didn’t know before heading to rainbow Mountain is how breathtakingly beautiful not just the mountain, but the entire hike would be. There are llamas and alpacas all along the trail, you got a gorgeous view of the Ausangante Glacier, and it’s not just Rainbow Mountain that is colorful. All of the mountains are various shades of reds and greens. Yes, this hike is popular. In a lot of ways, it is quite touristy with people at the top dressed up with bedazzled llamas asking if you want to take pictures. But there are plenty of things in this world that are touristy for a good reason, and Rainbow Mountain is one of them. I thought it was incredible and I can’t wait to do it again, so I don’t mind that I had to share it with a few other people. You’re at a pretty high altitude, as I’ve mentioned excessively already, which means it can be very cold. I even had a little bit of snow at the top and hail as I came down. However they were the small hail balls which was exciting for me because it reminded me of Dippin’ Dots. Free Dippin’ Dots falling from the sky!? Heck yeah. Bring gloves, bring a waterproof jacket, and bring layers. Absolutely don’t forget to bring sunscreen, as you can get fried at altitudes like that. A lot of people don’t go all the way to the very top of the mountain. I understand it’s very difficult, but they’re missing the best part! If you have altitude sickness symptoms, descend as quickly as you can. It’s nothing to mess around with. But if not, try to go all the way to the top. You get a 360° view not just a rainbow Mountain, but of the nearby glacier and a gorgeous valley in the other direction. I think most people didn’t realize what they were missing by not going all the way up. So should you do Rainbow Mountain? Yes, it is touristy, but that doesn’t make it any less amazing. As long as you’re prepared for the altitude, dressed warmly, and willing to take a horse if you need to, it’s totally worth checking off the bucket list. After all, how many mountains in the world are dressed as a rainbow? Thanks for this great advice on all the options of experiencing and reaching Rainbow Mountain safely and properly. While Instagram and social media contributed to the huge surge in visitors the real culprit appears to be the changing climate? Would you agree? This post reminded me of a National Geographic article (my memory fails, it could be another source, even an environmental journal) revealing this hidden secret a couple of years ago (2015-2016-ish) as a result of the retreating glacier and less snow-cover uncovering this. I hope to explore this one day and will not let ego impede my judgment of needing assistance (e.g., a horse). I am glad on the positive side, that the touring is helping the local economy that was so depressed. I feel this might be an opportunity for tourists to see such a huge impact of climate change (or just the impact we have on our world!) and there are models of touring that protect the environment out there. I know some people who are doing a “glacier farewell tour” where they are going all over the world to see the retreating glaciers before they are all gone or severely reduced (not all are disappearing so soon, but ones like in Peru, Mt. Kilimanjaro, Alaska). I tell people that retreating glaciers in themselves could be part of the ebb and flow of such things in Earth’s history; it is the speed of the retreat which is breathtaking, unique, and worrisome. There are some that are temporarily growing like in New Zealand, to be fair and balanced, but these are unusual (some from added snow as temperature rises toward freezing since can hold more moisture, more snow). Glaciers can sometimes provide a clear-cut story though of how the recent warming is having a physical, visible impact. I think if people can simply show some respect for where they are traveling that it is great for people to want to appreciate the world they live in and explore all the beauty as possible! This is our home and we should enjoy it while keeping it in order. I will get off my soap box now (I could certainly do more myself than I have)! BTW your tours look so awesome! Agreed it’s only the retreating glacier that has exposed this rock. I hate to say, everyone speaks of how there used to be abundance when they were younger, all over the world, with fish, animals, etc. The overwhelming info I’m getting is weather is changing and there is less and less out there. So many people from different corners of the globe all agreeing on one thing, now that’s interesting. Thanks for this great advice on all the options of experiencing and reaching Rainbow Mountain safely and properly. This is a fabulous article about Rainbow Mountain and value information for all of u. Thanks! I am Peruvian and I can’t wait to do this hike. I haven’t done it so I don’t know, but I understand it can be pretty tough so you might be happy to have mules carrying your gear, if they offer that. I’d just take a tour probably. It’s the easiest way to get there and I’d just go with the cheapest. They all bring you to the same place.